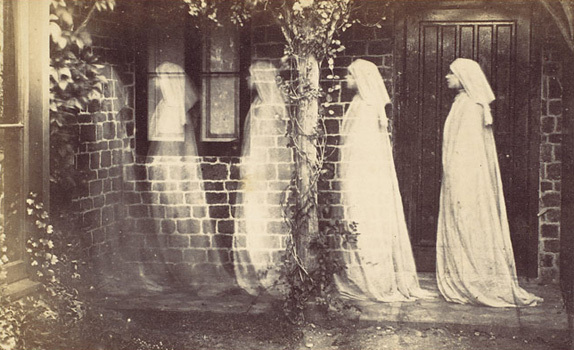 Anonymous, 'The Ghost of Bernadette Soubirous,', 1890, black-and-white photograph. No one knew that better than Kathryn Tucker Windham, an Alabama folklorist who spent much of her life collecting and patiently preserving Southern superstitions, recipes, and, most of all, ghost stories. Before passing away last June at the age of ninety-three, Windham published four cookbooks, eight ghost-story collections, and more than a dozen works of regional mythology, memoir, and fiction, most of them featuring her own household ghost, a Slimer-esque jester whom the Windhams affectionately named Jeffrey. Windham chronicled the civil rights movement for the Selma Times-Journal through the fifties and sixties, churning out articles and photographs that documented the internal crisis of the South. In her day job, Windham wrote scathingly about the worst that Alabama had to offer: racist taunts, KKK gatherings, tear gas and billy clubs on the Edmund Pettus Bridge. But in her books, she celebrated the state’s best: folk artists, snake handlers, and magnificent chefs. 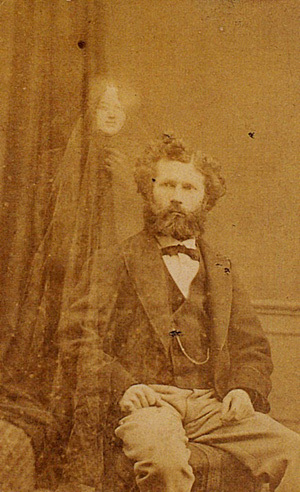 Edouard Isidore Buguet, 'Spirit photograph portrait of Camille Flammarion,' 1874, black-and-white photograph. 13 Alabama Ghosts and Jeffrey, Windham’s first in a series of state-by-state anthologies detailing the local “ghosts of distinction,” came out in 1969, when Birmingham was better known as “Bombingham.” It’s a charming book, the best of her “13 Ghosts” series, but it’s also a remarkable historical work. (It is, in fact, required reading in many state elementary schools for their local-history course.) 13 Alabama Ghosts is, at heart, a work of conservancy, preserving the tales passed down through families, footnotes to the official historical record. There’s the story of the luxurious steamboat Eliza Battle, Alabama’s Titanic, which caught fire in the icy waters of the Tombigbee River in 1854, killing half of its passengers. “On stormy nights,” Windham wrote, “they saw the great steamer rise up out of the troubled water … and always there was music, dancing tunes, providing a background for the shrieks of terror and cries for help that came from the phantom vessel.” The restless spirits of the Confederacy blow tobacco smoke at the current owners of their houses, and women who died childless tuck tots into bed with their ethereal hands. In a group of men gathered about the square on a sultry afternoon of his arrest feeling against him ran high … In a black ragged cloud west of town the rumbling of thunder lent an additional menace to the already ominous situation. Soon someone produced a rope. His face grey with fear, Wells shouted at the top of his lungs, “I am innocent. If you kill me, I am going to haunt you for the rest of my life!” And as later events proved, he did. After the lynch mob had done their frenzied work and dispersed, an apparition in the image of Wells’ face, tense with fright, appeared in the courthouse window. It’s still there, streaky and pale, a Rorschach test for the Southern conscience. It’s not a novel sentiment. Flannery O’Connor, the mistress of Southern ghouls, wrote in her essay “The Grotesque in Southern Fiction” that the impulse to tell stories is an act of reparation “that demands that what falls at least be offered the chance to be restored.” Windham’s ghost tales offer a similar comfort, a hopefulness that the events of history are not as far gone as we might think, that they might still be corrected. What Windham recognized is that all history is made of ghost stories, whether we choose to believe them or not.